Smart materials are becoming pervasive in many areas of engineering to help devices monitor and collect information about their environment and to assist in specific tasks. The materials—which include ceramics, polymers, and metal alloys—are becoming smaller and smarter. In the Smart Materials’ Advanced Research and Technology (SMART) Lab at Georgia Tech, one of the team’s focus areas is lead zirconate titanate (known as PZT). It is one of the world’s most widely used piezoelectric ceramic materials, in which the compound can transform shape when an electric field is applied. PZT can measure changes in pressure, temperature, and force. Piezoelectric materials were first implemented during World War I, when they were used to detect submarines acoustically. Today the materials have the potential to be inserted into the brain to treat neurodegenerative diseases including Parkinson’s, and they can be applied to structural-health monitoring in nuclear power plants. 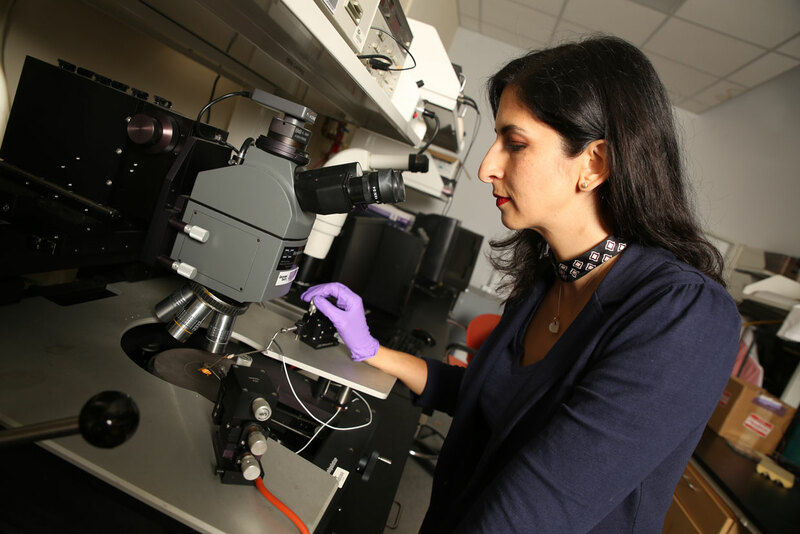 Those are the types of projects being conducted at the SMART Lab, directed by Senior Member Nazanin Bassiri-Gharb, an associate professor at Georgia Tech's Woodruff School of Mechanical Engineering and School of Materials Science and Engineering. She’s also president of the IEEE Ultrasonics, Ferroelectrics, and Frequency Control Society. In this talk with The Institute, she provides more details about the work the lab is doing. Why is your lab focused on PZT? PZT is multifunctional and can be used for a host of applications including in robotic systems, energy harvesting, and data storage. One application we’re looking into is integration of the material in small devices for environments that are harmful to humans. After the Fukushima Daiichi nuclear disaster, in Japan, for example, it was unsafe for people to go in and verify the radiation level in the power plant. Robots that cost several hundred thousand US dollars were sent in, but their materials soon broke down from the radiation’s effects. PZT could be applied in much cheaper robots, as small as an insect. These millimeter-sized robots would be substantially more resistant to radiation than many of the current units, based on the current electronic controllers, memory and transducers—which are mostly based on semiconductor technology. And while PZT is not fully impervious to the effects of radiation, the cost reduction with respect to the current technology and the substantial improvement in radiation hardiness will be so staggering that losing a device or 10 won’t be significant. What are some of the challenges when working with smart materials? PZT thin films, for the smaller MEMS devices, must be processed at temperatures of between 700 and 800 °C. But to integrate PZT with CMOS technology, which provides the electronic decision-making ability, it can’t be processed at temperatures higher than 400 °C. Otherwise the CMOS functionality is lost. My group is developing manufacturing approaches whereby the heat for the PZT processing is contained within the uppermost layers and does not affect the underlying CMOS device. If we can do that, we can develop fully miniaturized devices for various applications—which are particularly of interest for health-care applications where you want to be least invasive. We have found that the smaller we make the piezoelectric materials—down to the micro or nano level—the more we need to understand their fundamental behavior and how they interact with their environment. We can’t design the next generation of materials without understanding this first. Are there health concerns about using smart materials in the human body? PZT does have lead, but if we can contain it, there shouldn’t be health issues. We would have to test any device to determine how long it could remain in the body and not cause harm. Of course, if we discover new, lead-free material, with the same quality of functional response of PZT, we would substitute it. There are many other compositions of piezoelectric materials, some also without lead. But we, as a scientific community, have been unable to replicate the very high responses of PZT ceramics in these materials. Beyond PZT, there are a few other materials, still lead-based, that show even higher functional response than PZT, but they usually have even more demanding processing conditions. The cost is higher and the applications more niche. One application that we cannot develop without these new higher-response but still lead-containing materials is medical ultrasound. These devices still heavily use the piezoelectric elements for ultrasound wave transducers. We would love to make these transducers smaller, of course—an ultrasound pill that is minimally disruptive to the patient and potentially could be used to remedy locally if a specific issue is found. You’re also working to apply PZT to treat neurodegenerative disease. Tell us about that. Those with neurological diseases, like Parkinson’s and Alzheimer’s, have uncontrollable brain neurons that discharge multiple electrical signals at a fast rate. Currently there is a treatment for Parkinson’s that involves inserting four electrodes 10 to 12 centimeters deep into the brain. When the brain’s electrical signals are moving quickly, as in Parkinson’s, the electrodes are actuated and the neurons can be returned to their original baseline behavior. We want to replace this treatment with PZT material, but make it so small, about the size of a dust particle that can be implanted in the brain and stimulated through acoustic waves far less invasively than current treatments. Similar work with so-called neural dust has been done at the University of California, Berkeley. But it faces the challenge of taking a bulk ceramic material and dicing it down to those dimensions. Our goal is to create the material in small enough a size and properly integrated with the electronics so the dimensions of the final device are as small as possible and the procedure is as minimally invasive as possible. How far off are those applications? Some already exist, but they’re not yet using all the materials’ functionalities. For example, the military has been developing small robotic units based on PZT for surveillance. Within the next 10 to 15 years we could have fully autonomous millimeter-size robots to monitor our environment for security and air quality. With respect to the biomedical applications, some are clearly closer at hand than others. The medical ultrasound has been available on the market for many years. The challenge is to make them much smaller. Our colleagues at University of Glasgow have been pioneering some of the devices already, so I would say the same time frames apply. One of the greatest challenges for biomedical applications, specifically when the devices are in continuous contact with the living tissue, is to make the materials safe. So I won’t dare forecast when the smart brain dust will be available, but I certainly hope to see an impact during my career.